Newer Model Available: SleepStyle 238 CPAP Machine with Built In Heated Humidifier. 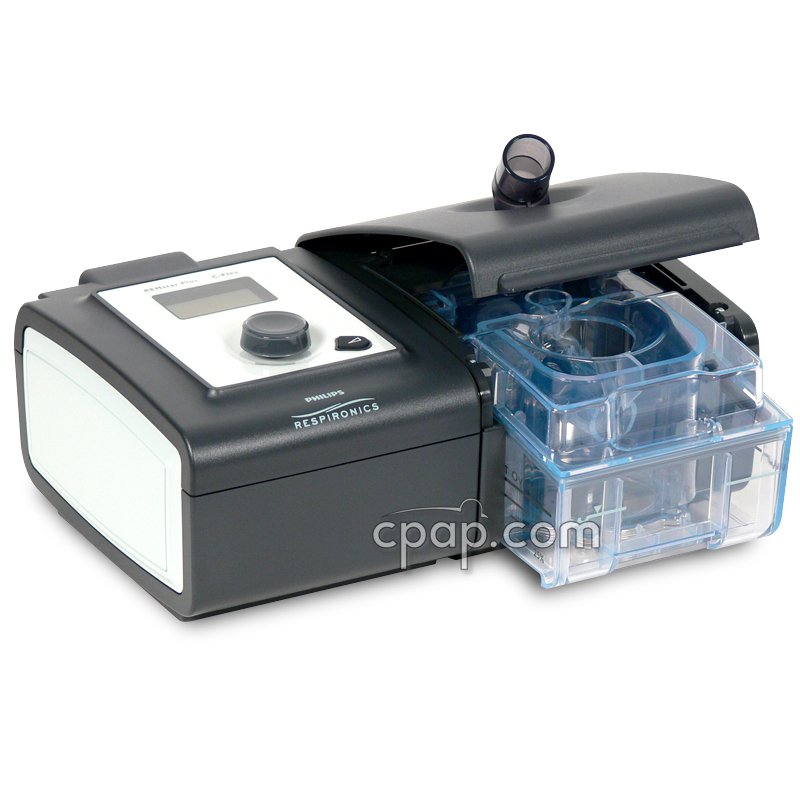 The Sandman Intro CPAP machine is lightweight, compact and user-friendly. Covidien has included several features such as AC or DC battery capable, auto altitude compensation, and a new humidifier technology called HumidControl. The built in humidifier actually measures the temperature outside the chamber and adjusts the heater plate to minimize condensation. 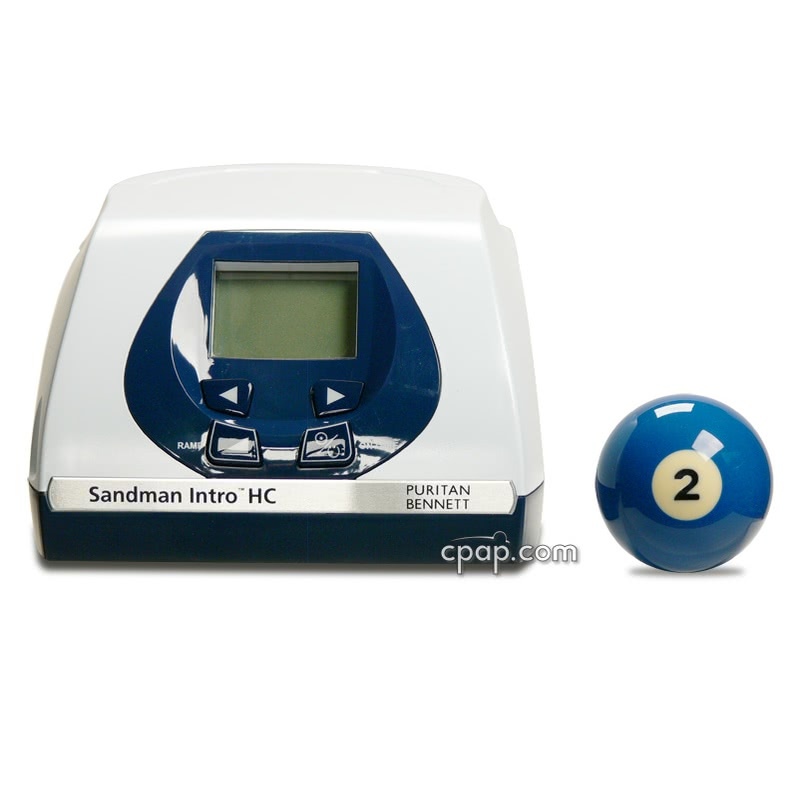 At 2.75 pounds, take the Sandman Intro anywhere and feel confident you will receive effective therapy. 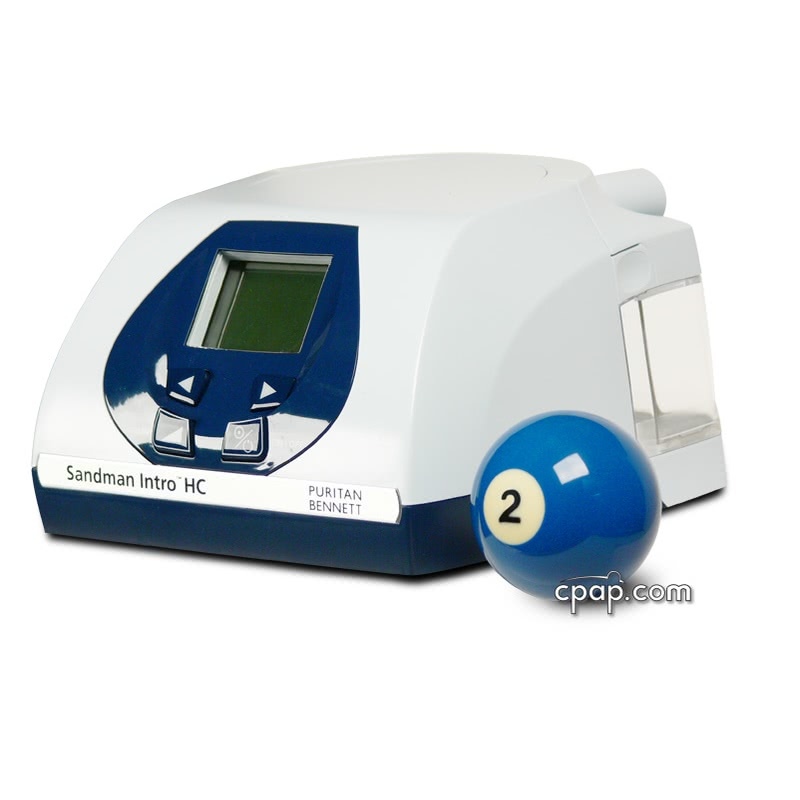 The Sandman Intro CPAP machine is designed to treat a broad range of CPAP users. Covidien's goal was to make sleep apnea treatment easy. The device is quiet, discreet and user-friendly. Small and light, traveling with the Sandman is convenient. Use either AC or DC power from an external battery source. If altitude is an issue, the Auto Altitude Compensation feature accounts for barometric changes. 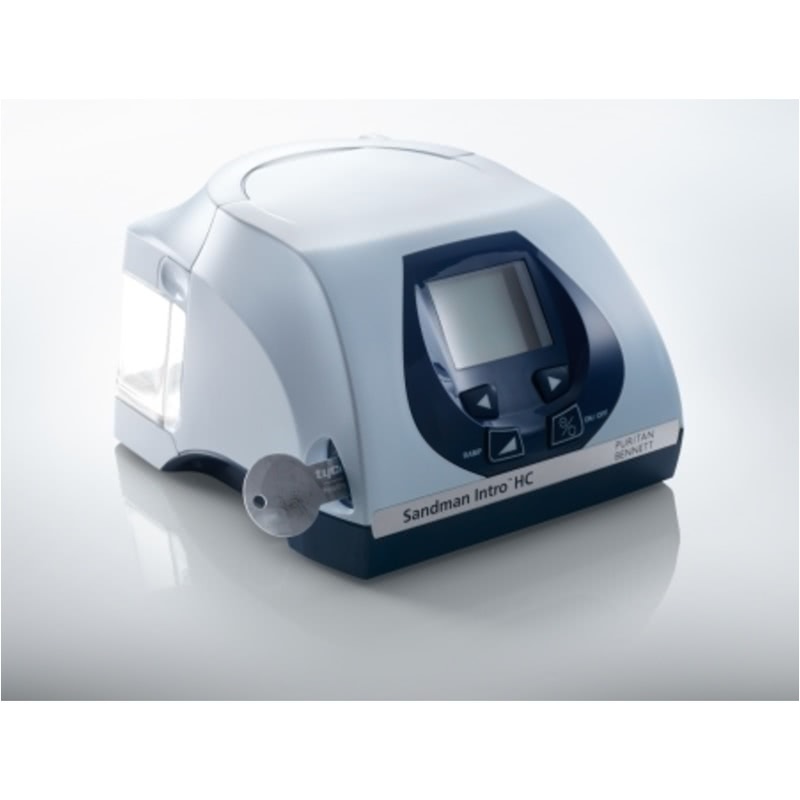 The Sandman Series uses Covidien's unique Adaptive Pressure Stability (APS) technology that limits the peak to peak variations of CPAP pressure when a user breathes in and out. Adaptive Pressure Stability responds quickly and accurately to several common conditions that result in changes from your prescribed pressure down to each breath. Covidien also addresses the need for humidity, incorporating a built-in heated humidifier, together weighing only 2.75 pounds. 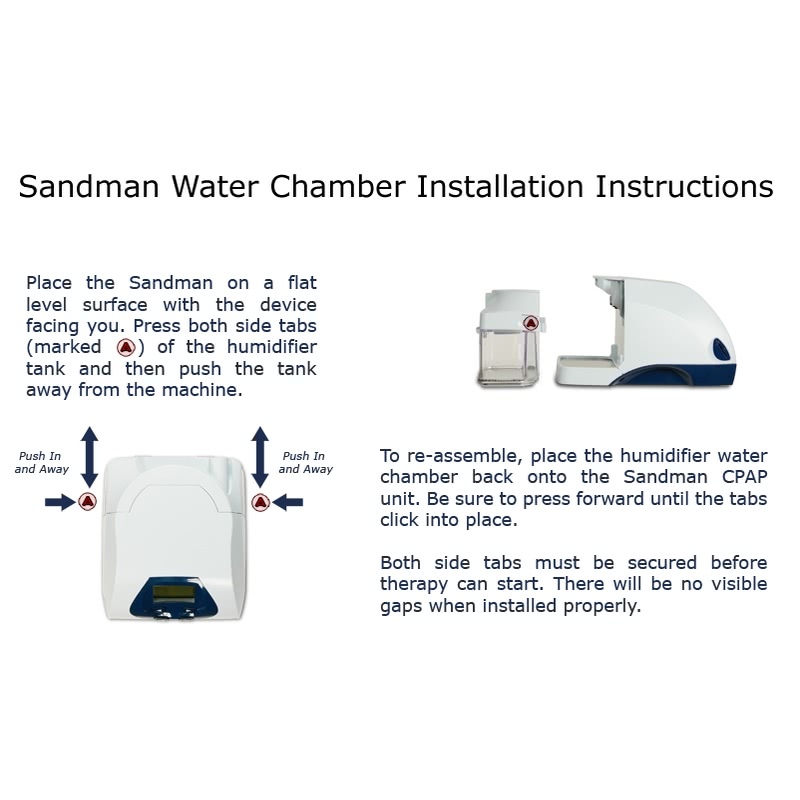 The humidifier is located to the rear of the CPAP with a water chamber that is easy to clean. 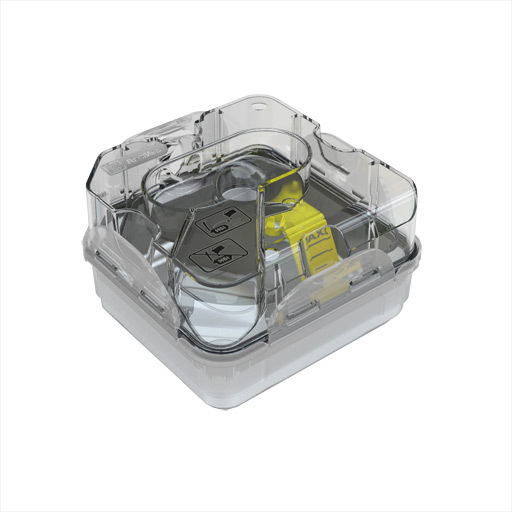 Using a new technology, HumidControl, the humidifier provides the best temperature according to the relative humidity outside the water chamber. This prevents water from collecting in the CPAP hose and keeps the humidification level constant throughout the night. Altitude Compensation Automatic - maximum height 9000 feet. 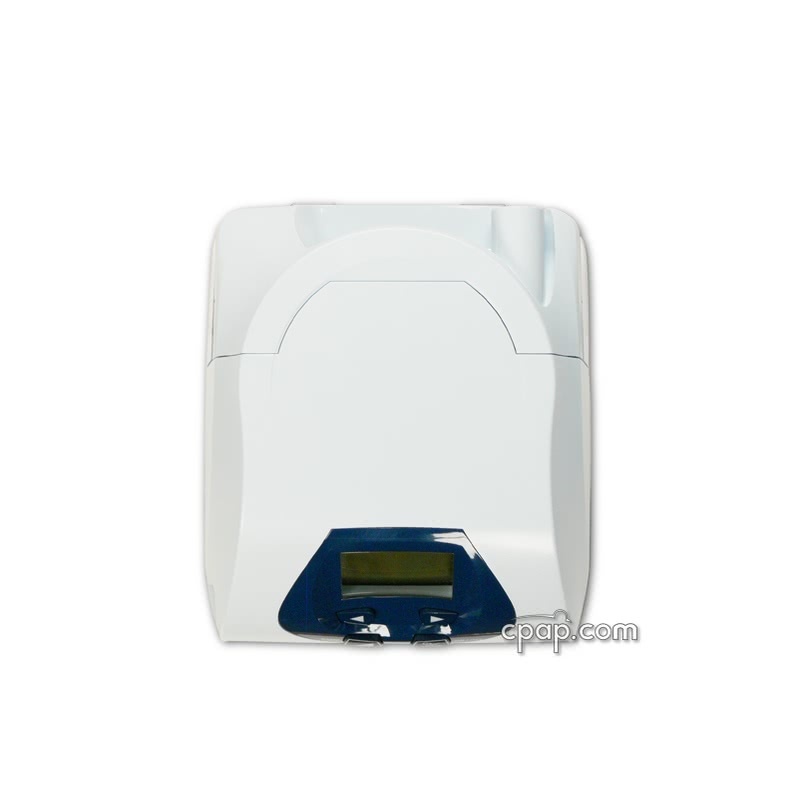 AC Power Consumption: 100 - 240 VAC, 50/60 Hz, 1.7 A max. Electromagnetic Compatibility: The device meets the requirements of EN 60601-1-2, 2nd edition. Be aware that the CPAP-only version of this product cannot be upgraded to accommodate a heated humidifier. What are the benefits of using a humidifier? Many CPAP users experience nasal congestion and dryness of the nose and throat during treatment. This can be especially problematic for new users who are adapting to treatment. Humidification adds moisture to the air helping to reduce the symptoms of dryness and congestion. Nasal congestion also leads to mouth breathing, which perpetuates the problem of dryness. If this is an issue for you, try a heated humidifier. What is a heated humidifier? A heated humidifier uses heat to warm the water to add moisture to the airstream. The heat is adjustable for more or less moisture. 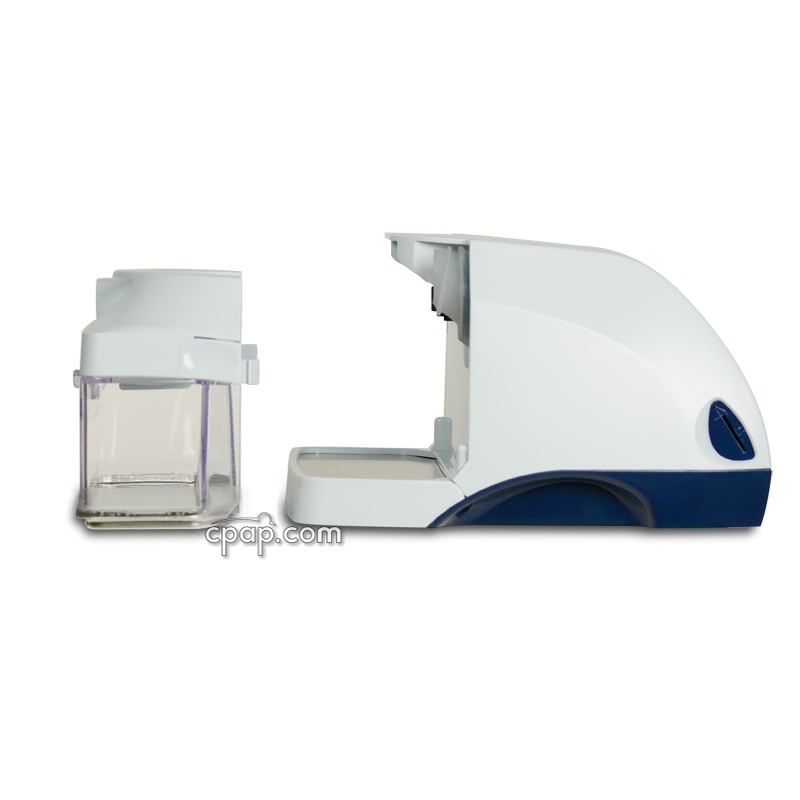 A heated humidifier water chamber is much smaller than a passover humidifier water chamber. In our experience, it is common for CPAP users to report that their therapy is greatly enhanced by the use of a heated humidifier. 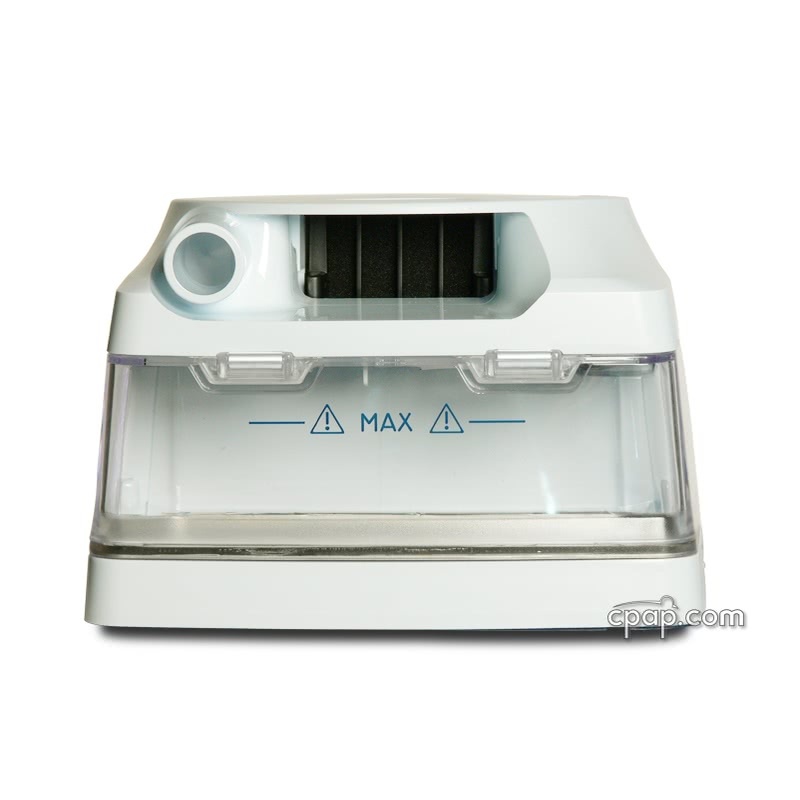 Stand Alone Humidifiers can be used with almost any machine as long as an integrated humidifier is not being used and the machine does NOT have a built in humidifier. The Fisher & Paykel HC150 Heated Humidifier With Hose, 2 Chambers and Stand is a stand alone heated humidifier that includes ambient tracking to keep the humidity consistent independent of room temperature. What is a built in humidifier? A "built in" humidifier is designed as a part of the CPAP machine and cannot be removed or separated from the CPAP machine. As with an integrated humidifier, the design eliminates the need for a second hose or power cord. The water chamber can be removed for cleaning or replacement purposes. The advantage of a "built-in" humidifier is its compact shape, which operates on fewer parts. This integrated design helps to ensure optimum moisturized comfort and effectiveness when CPAP therapy and humidification are used together. Also, it allows an option for the humidification to be turned off while the CPAP is blowing. A disadvantage is that a built in humidifier may produce less moisture if used as passover because the surface area is typically smaller. Also, since the humidifier is "built in" to the machine, detaching it is not an option. This can be an issue for frequent travelers. Lastly, if the machine or humidifier stops working, the entire unit must be sent in for repair or replacement, not just the component that failed. 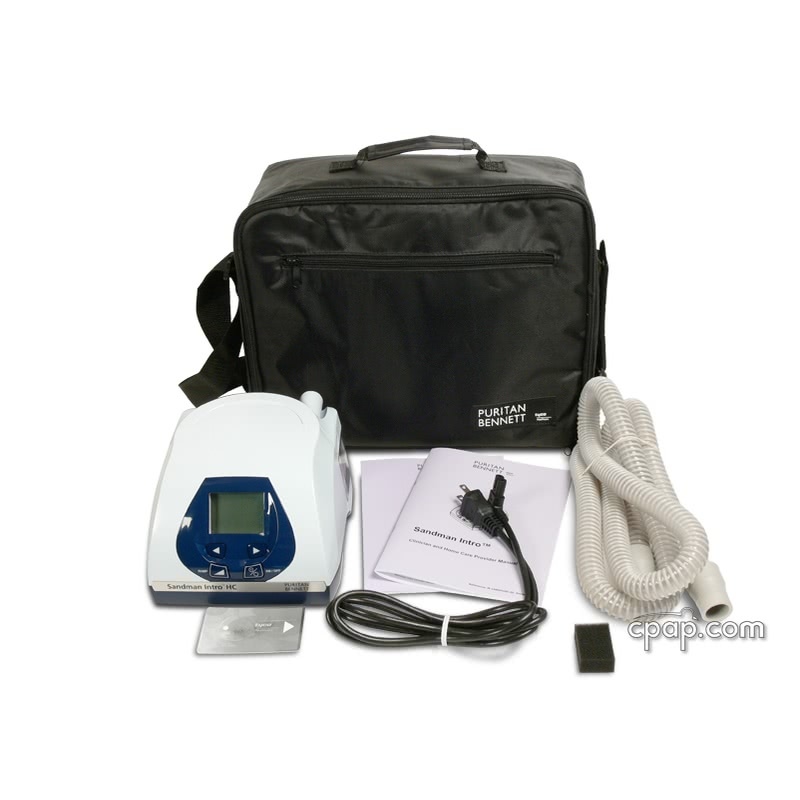 An example of a machine with a built in humidifier is the ICON Auto CPAP Machine with Built In Heated Humidifier and SensAwake as seen below. What is a passover humidifier? A passover humidifier uses a chamber of room temperature water with the CPAP to add moisture to the airflow and reduce irritation to the nasal passages. Air flows from the CPAP through a short hose to the humidifier chamber where the air "passes over" the water to pick up whatever moisture it can. The air then flows into the six foot hose to the mask. 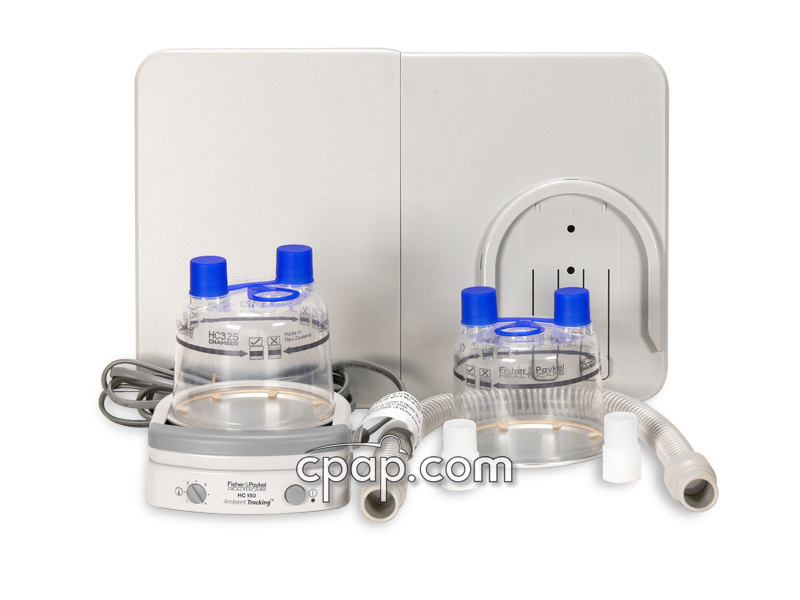 Passover humidifiers may provide sufficient moisture with CPAPs set at lower-end pressures. However, if the moisture is not sufficient there is no way to increase the amount of moisture added. The water is room temperature. In cold climates, the water temperature will drop causing the CPAP air to become very cold, and causing the amount of moisture to be reduced. What is an integrated humidifier? 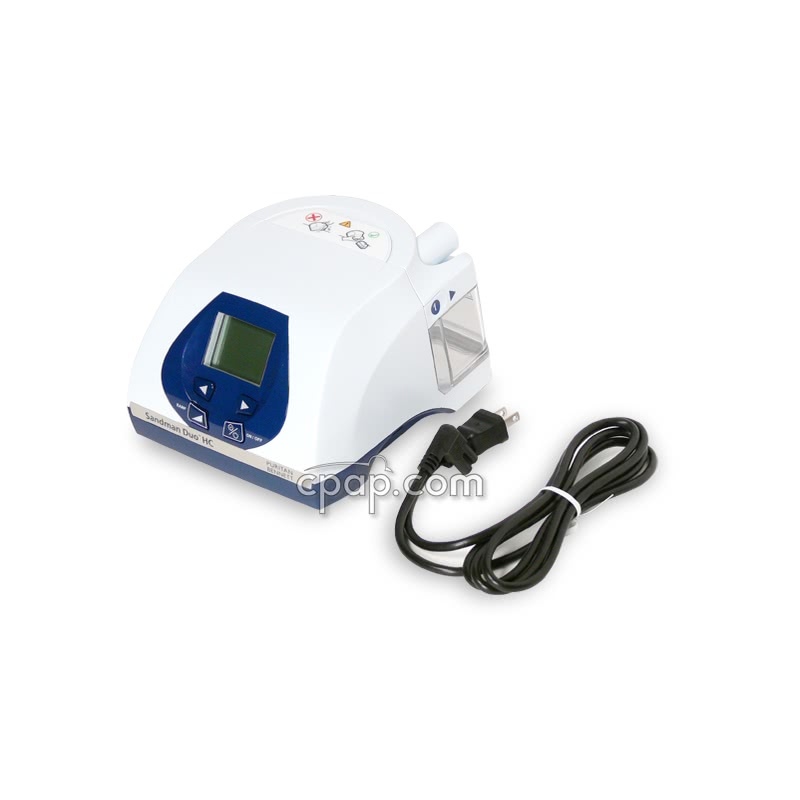 An integrated humidifier is used with a specific CPAP and fits directly onto the machine. For most heated humidifiers, this design eliminates the need for a second hose as well as a second power cord. An advantage of an integrated humidifier is that it works very closely with the CPAP machine to deliver humidification. Also, an integrated humidifier is a compact unit that uses fewer parts to provide moisture to the user. A disadvantage of the integrated humidifier is the user will receive less moisture when it is used with a passover humidifier. The smaller surface area effects the amount of moisture produced. Also, a integrated humidifier will only function with the CPAP for which it was designed. You can see if your machine has an integrated humidifier option by reviewing our Compare Charts. 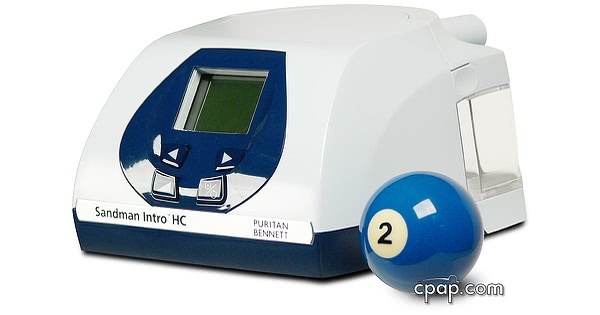 An example of an integrated humidifier is the PR System One Heated Humidifier as seen below attached to a machine in the PR System One line. What is a stand alone humidifier? 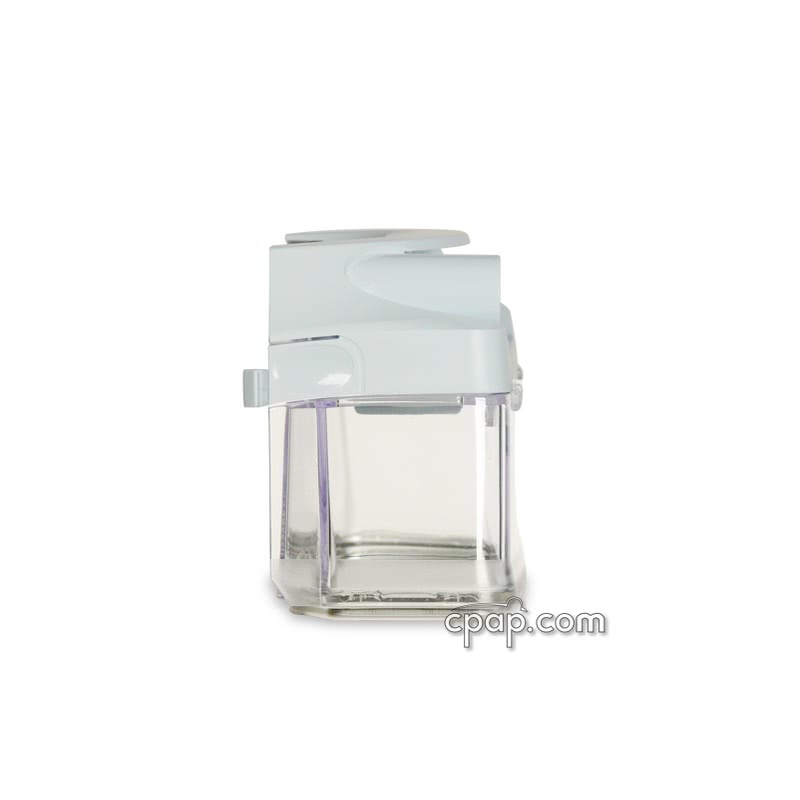 A stand alone humidifier is a component that will work with any CPAP and does not attach directly to the machine. It has its own power cord and a short hose to connect it to the CPAP. Generally it will sit next to the CPAP machine and is slightly larger than an integrated humidifier. 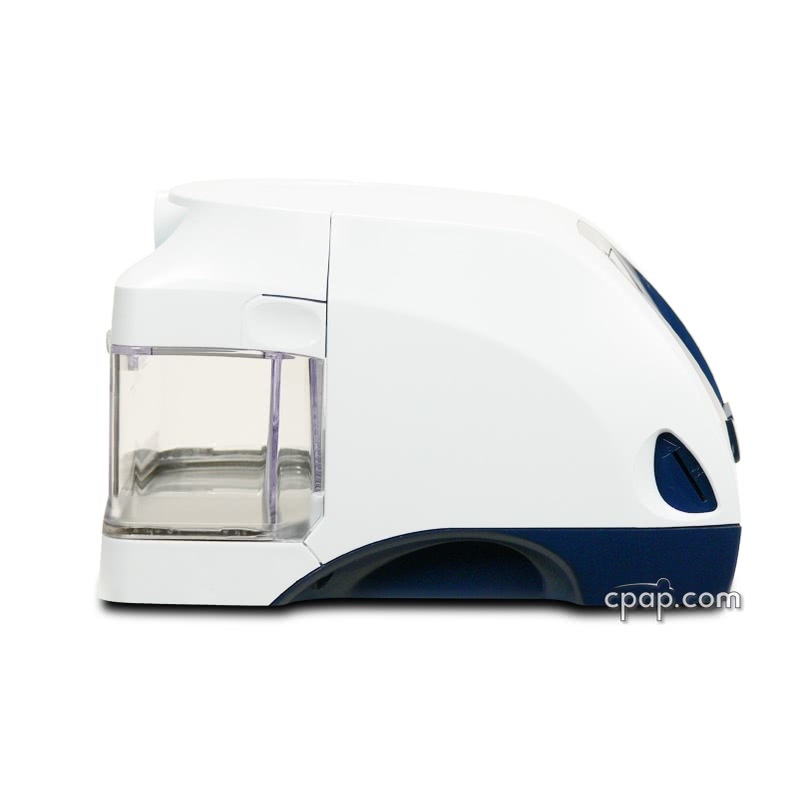 The advantage of a stand alone humidifier is the fact that it may be used with any CPAP machine. 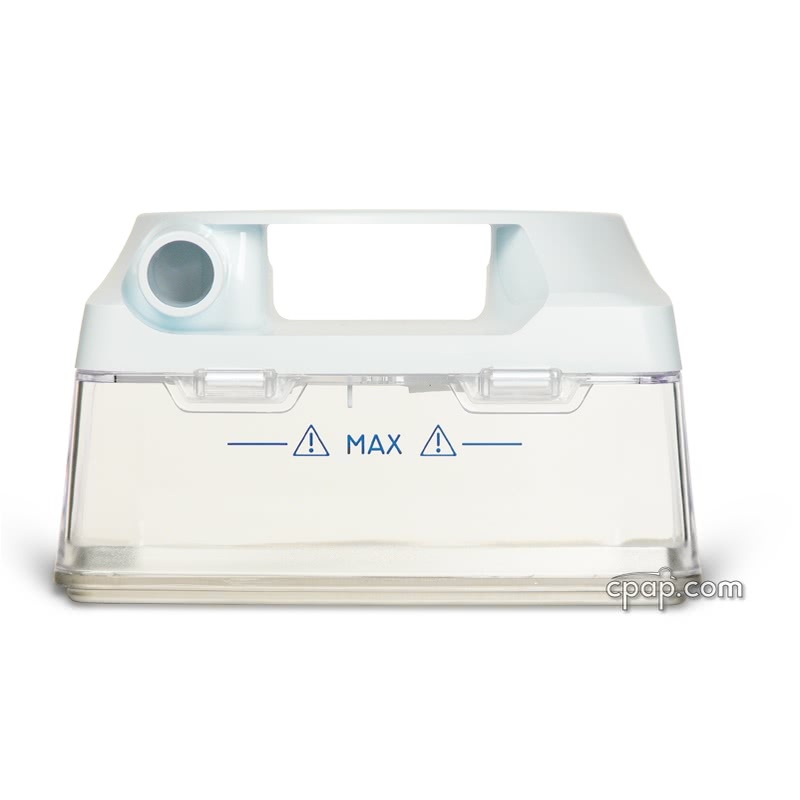 The main disadvantages are that the size is often larger than either a "built in" or integrated humidifier and that a short hose is needed to connect it to the CPAP machine. An example of a stand alone humidifier is the Fisher & Paykel HC150 Heated Humidifier as seen below. Rainout is the accumulation of water in a CPAP tube due to warm moist air cooling and condensing on its way from your CPAP machine to your CPAP mask. The image below from Fisher & Paykel explains how rainout is formed. Warm, moist air leaves the heated humidifier and travels through the CPAP tube. As air flows through the tube, the temperature of the room causes the tube to cool. As the tube cools, the air inside releases its moisture, and creates condensation in the hose. Raise the temperature of your bedroom. Keep your CPAP machine at the same level as your bed. Insulate your tubing with a hose cover like Snugglehose. Reduce the temperature setting on your heated humidifier. Purchase a CPAP machine with a rainout reduction comfort feature. Some machine systems offer a compatible heated CPAP hose which maintains the temperature from the machine all the way to the mask, reducing the occurrence of rainout. The list of available heated hoses can be found here: Hoses With Heating Coils. If your machines uses a standard hose, consider the Hybernite Heated Rainout Control System. How do I care for my humidifier? To care for your humidifier simply empty and clean the water tank each morning. Only distilled water should be used in the humidifier to avoid mineral deposit build up. Why do I need to use distilled water with in my humidifier chamber? If distilled water is not available where you live, use bottled water. It will be important to clean the chamber each morning, do not leave standing water in the chamber between uses. What does a humidifier prescription need to say? 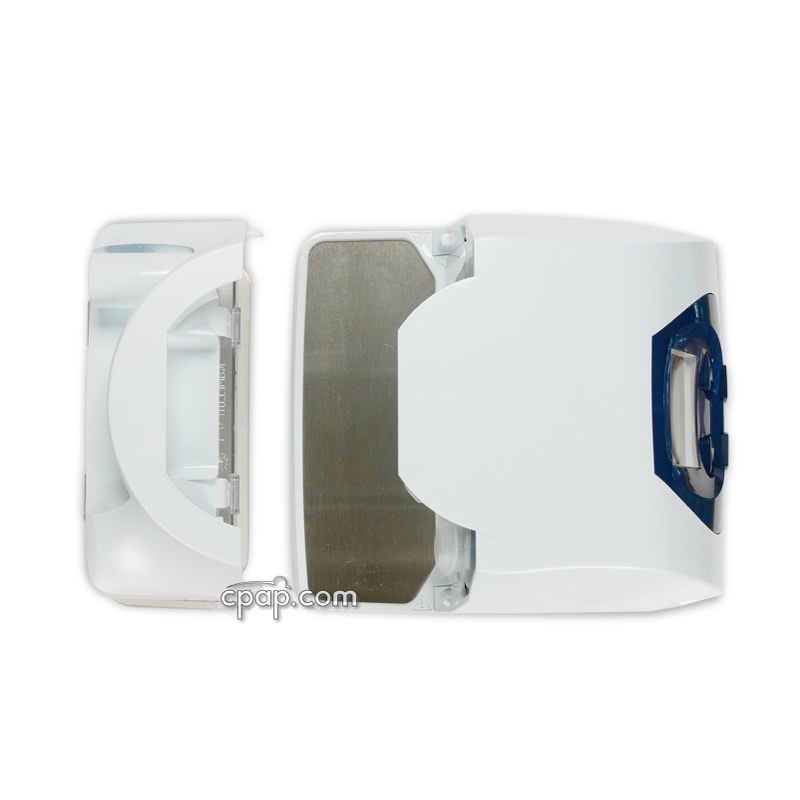 One of the following words or phrases: "CPAP Humidifier", "Humidifier", "HH", "CPAP Supplies", "CPAP Mask", "CPAP", "Continuous Positive Airway Pressure", "APAP", "AutoPAP", "AutoSet", "Auto CPAP", "Auto Adjusting CPAP", "Self Adjusting CPAP", "BiPAP", "BiLevel", "VPAP", "BiPAP Auto", "BiPAP ST", "Synchrony ST", "VPAP ST"